Karin Aguilar-San Juan is associate professor of American studies at Macalester College in St. Paul, MN. With a comparative and race-cognizant approach, Karin Aguilar-San Juan explores how Vietnamese refugees and immigrants retain their identities in the U.S. in her new book, Little Saigons: Staying Vietnamese in America. She agreed to answer a few questions with regard to her book's content, its cover image (which was taken by her), and thoughts about Vietnamese American communities today and their popular-culture depictions (The O.C., The Real Housewives of Orange County, etc.). I took this photo in January 1999. It was during the time of the protests in Orange County’s Little Saigon, sparked by a storeowner and a poster image of Ho Chi Minh. Many days before, the storeowner had been escorted out of his Hi-Tek video shop by a SWAT team in full riot gear. He had made several incendiary statements about “freedom” (timed with Martin Luther King Day) that did not sit well with certain groups of Vietnamese -- particularly those who are ex-political prisoners. Many of those men spent up to 15 years in political detention in Viet Nam; for good reasons, their rage constantly simmers. In addition to fully armed police from several surrounding cities, the Hi-Tek riots brought dozens or maybe hundreds of ordinary Vietnamese people to the area. They filled the parking lot with speeches, rallies, flags, banners, and exhibits. It seemed to be both angry and also festive, as any large gathering might become over time. There are two people visible in my photograph. I don’t know them. They were standing near a booth where people were making small paper versions of the South Vietnamese flag. Q: What are the most striking differences between the Vietnamese American communities in Orange County and in Boston? You have lived in each community at some point; what were your reasons for choosing to study and compare these two locations? I was born in Boston and I lived there for over a decade. Things there seem “normal” to me. My first impressions of Orange County were shock and morbid fascination. It was like stepping into a bad TV show. The sun always shines, the palm trees sway in the breeze, and every visible person is white and very rich. Every lawn looks like a golf course. It reminded me of the kids' book A Wrinkle in Time, in which suburbs are terrifying for reasons no one can explain. Sociologically, it made perfect sense [for this book] compare these two places. They are so different. But Vietnamese Americans seem to like each place well enough to call each one “home.” There was a puzzle about place and community, and that was a good impulse to follow. In the debate over the future of books, the specter of their being broken into parts —chapters, sentences, phrases—is relatively ignored. Preoccupied with whether books will survive at all, critics have ignored a more urgent question: In what new ways will serious writers and thinkers express themselves, given the upheaval in book publishing? It's not impossible to envision a future in which stories that are part of a short-story or essay compilation can be purchased individually. And as e-books make their way into the academic world, it's not out of the question to predict that one day soon, students will be able to purchase only the book chapters necessary for coursework, and not an entire book. What do you think? -In related publishing news, NYT has a report about Beast Books, a new imprint created by The Daily Beast and Perseus Books Group with a strategy to publish books faster--by first releasing them as e-books, and following later with a paperback release. The whole process (from writing to editing to published) would be complete within a matter of months. 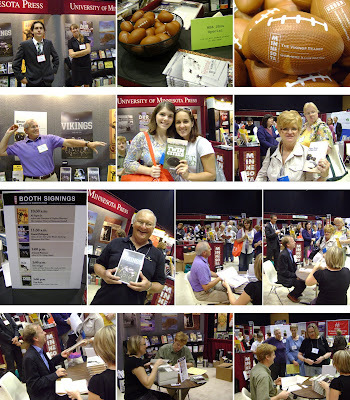 Here's a peek at the posters we'll be giving away at the Midwest Booksellers Association trade show this weekend. Look closely, and you'll see a sampling of 100 book covers from our extensive list of titles that focus on the upper Midwest region. Want us to mail you a poster? Send an e-mail to sattl014@umn.edu. The University of Minnesota Press recently collaborated with U of M News Service to create this video that features Highway 61 Revisited: Bob Dylan's Road from Minnesota to the World, a compilation of essays edited by Colleen Sheehy and Thomas Swiss. Daniel J. Philippon is associate professor of English at the University of Minnesota-Twin Cities. He is editor of Our Neck of the Woods: Exploring Minnesota's Wild Places (Minnesota '09) and author of Conserving Words: How American Nature Writers Shaped the Environmental Movement. Today, he writes about why Our Neck of the Woods is "decidedly old school." So it goes with books, as publishing is not a non-zero-sum game. 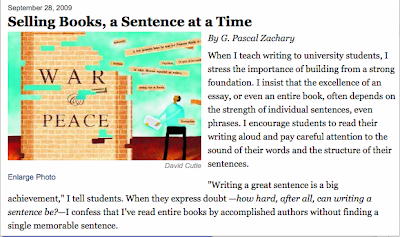 Choose to do something one way, and you can't do it another way--at least, not until the second edition comes out. Thus have my thoughts been turning since I caught my first glimpse of Our Neck of the Woods: Exploring Minnesota's Wild Places, the recently published collection of nature writing I edited. What struck me most about the book is the relationship between words and images, and how the choice I made early in the editorial process not to include illustrations has created a certain kind of book, and prevented another kind of book from coming into being. Don't get me wrong: this is not the voice of regret, wondering how I could ever have imagined a nature book without images! Quite the opposite. Now, more than ever, I'm certain I made the right choice. Our Neck of the Woods collects fifty-seven "sense of place" essays from the last twenty years of Minnesota Conservation Volunteer, a donor-supported magazine that has been published by the Minnesota Department of Natural Resources since 1940. What's great about the Volunteer is how visually appealing it is. Every issue is jam-packed with drawings and photographs from some of the region's most talented wildlife and landscape illustrators. But after years of reading the Volunteer, I realized that all this visual beauty comes at a certain price; "acts demolish their alternatives," as Salter suggests. "Demolish" may be too strong a verb here, but a milder truth remains: so alluring are the images in the Volunteer that they run the risk of eclipsing the writing they accompany. Not prevent it from being read or appreciated, mind you, but prevent it from taking center stage. And that seemed a shame, because the writing is something special, particularly the personal essays that occasionally appear under the heading "A Sense of Place." What to do, what to do. Well, being an academic who spends his days surrounded by paperbacks, the answer seemed obvious. It was time to make a book. Fortunately, the staff at the Volunteer had been hoping someone would do just such a thing, and when I approached Kathleen Weflen, the magazine's longtime editor, she generously allowed me to develop what became Our Neck of the Woods. The result, I hope, is something that didn't exist before, even though all of the essays have previously appeared in the Volunteer and a few of them are even available online. (As my fellow academics might put it, in synthesis we create new knowledge.) In particular, my goal was to call attention to this powerful series of personal reflections by selecting and organizing a representative sample by subject matter and location. The cover, a composite of three photographs by Gary Alan Nelson, itself suggests the three Minnesota biomes the book seeks to represent: the North Woods, the Big Woods, and the Prairie Grasslands. But it also illustrates what the rest of the book attempts to do without illustrations: picture Minnesota's wild places. We are, today, awash in images: we ride to work on buses encased in ads, distract ourselves by YouTube videos while there, and return home just in time to catch the latest episode of The Jay Leno Show. Images appeal for our attention at every moment. In contrast, Our Neck of the Woods attempts something decidedly old school: placing the written word front and center. My ideal reader for this collection, in other words, is just that: a reader. Someone who wants to be transported, in imagination, to a canoe in the Boundary Waters, a riverboat on the Mississippi, a duck blind on the prairie, and every place in between. (Imagination, from imaginare, "picture to oneself.") And that's what the best writing can do, can't it? Take us places we haven't been, or take us places we have been and show us something different. So whether these essays are new to you or not, and whether the places they describe are familiar to you or not, I hope their collection in Our Neck of the Woods will take you someplace unexpected. Imagine that. Daniel J. Philippon is associate professor of English at the University of Minnesota-Twin Cities. He is the author of Conserving Words: How American Nature Writers Shaped the Environmental Movement. He lives in St. Paul. 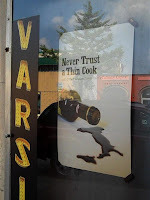 Check out this reading Eric Dregni, author of Never Trust a Thin Cook and Other Lessons from Italy's Culinary Capital, gave recently in Minneapolis. You can listen to the entire reading at once (19 minutes) or click on separate clips, ranging from 1-3 minutes, of sections that appear in Eric's book, including Eat Your Hat, Cowboy; Arrangiati! and La Ferrari. 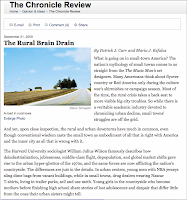 An article in the Chronicle of Higher Education, posted today, defines the "rural brain drain" as the persistent instance of educated young people moving away from the rural towns in which they grew up. Now, many of these small towns are on the verge of extinction, and it's time to ask: What is going on in small-town America? Most of the time, the rural crisis takes a back seat to more visible big-city troubles. So while there is a veritable academic industry devoted to chronicling urban decline, small towns' struggles are off the grid. And yet, upon close inspection, the rural and urban downturns have much in common, even though conventional wisdom casts the small town as embodiment of all that is right with America and the inner city as all that is wrong with it. Those Who Work, Those Who Don't: Poverty, Morality, and Family in Rural America, by Jennifer Sherman. Following the stories of economic collapse in a Northern California town and what they tell us about rural America. Westhope: Life as a Former Farm Boy, by Dean Hulse. An evocative and inspiring memoir of a vibrant rural North Dakota. Everyone Had Cameras: Photography and Farmworkers in California, 1850-2000, by Richard Steven Street. The relationship between California farmworkers and the photographers who have documented their lives. Days on the Family Farm: From the Golden Age through the Great Depression, by Carrie A. Meyer. A story both intimate and epic that paints a vivid picture of Midwestern farm life. 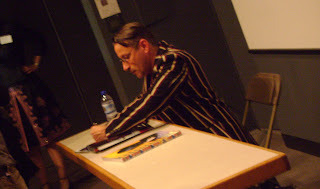 Legendary book-cover designer and author Chip Kidd graced Minneapolis with his presence yesterday. After spending time with students at the Minneapolis College of Art & Design, he gave a sold-out lecture there that was hosted by the MN Book Publishers' Roundtable. After a fantastic and lively presentation, he answered a few questions, including one about e-books and his thoughts about the future of books and design. He expressed skepticism about the popularity of the Kindle and mentions that popular media reports would lead one to believe that the very way we read will soon change, whereas e-book-buying statistics suggest otherwise (he said less than 1% of books purchased are e-books). Here's my problem with the Kindle: It's getting way, way too much attention ... My prediction is that the whole e-book phenomenon is going to be similar to the audio-book phenomenon. It's a section of the market, it's relatively small, audio books became popular because people could listen to them in their cars. Fine. E-books will be popular with people who want to spend the money for the technology, who want to travel a lot and don't want to lug the books around. Fine. But it's not going to be like the iPod. That was different. The full interview can be found here; the discussion about e-books begins about 45 minutes in. MPR also posted a slideshow of popular Chip Kidd covers. 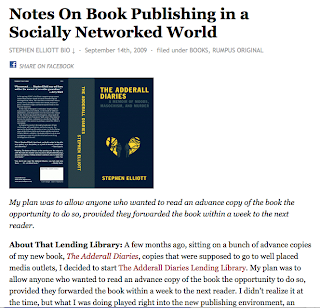 A few months ago, Graywolf Press author Stephen Elliott created a lending library for advance copies of his new book, The Adderall Diaries. For his efforts, the program received a lot of media buzz, and caused a lot of people, including publishers, to question how the project worked and whether it would be a success. The program has since ended, and Stephen Elliott has written about the results for The Rumpus. I didn’t realize it at the time, but what I was doing played right into the new publishing environment, an environment that is still uncharted and mysterious. A brave new democratic book world where everyone is a potential reviewer. Here are a few photos taken at yesterday's launch event for Eric Dregni's Never Trust a Thin Cook. The event was at the Varsity Theater in Minneapolis, and as you can see, it involved a book signing, slide show and samples of some great Italian food. Eric's wife, Katy, gave a brief introduction. Here is a 40-second excerpt in which she reveals how she and Eric became engaged in Italy. Within the week, full audio of Eric Dregni's reading (of several sections from Never Trust a Thin Cook) at this special event will be available on this blog. Today, eight years after the Sept. 11, 2001, attacks, marks the first year that this anniversary will be observed as a national day of service, following an order signed by President Barack Obama. -The Associated Press: What Obama was doing on Sept. 11, 2001, and speculation about what he will do to move forward in our nation's struggle against terrorism. -The Wall Street Journal: Why the president's campaign for the war in Afghanistan is a hard sell. -Slate asks why "the follow-on attacks that everyone predicted after 9/11" have not occurred. -The Huffington Post's William Bradley looks at where America has been and where it's going: "Eight years since 9/11. It feels like 18 years, if not 80." -The New Yorker's Lawrence Wright on underestimating Al-Qaeda. -On NPR.org, a firefighter father recalls losing two sons in the attacks: "I don't have any could've, should've or would'ves. I wouldn't have changed anything." -The Age calls the current delays in rebuilding Ground Zero (once slated to be completely rebuilt by 2011) "a national disgrace." -Primitive America: The Ideology of Capitalist Democracy, by Paul Smith. An urgent examination of the deep cultural roots of America’s response to 9/11. -Conspiracy Theories: Secrecy and Power in American Culture, by Mark Fenster. This new edition, the first in-depth look at the conspiracy communities that formed to debunk the 9/11 Commission Report, shows that conspiracy theories play an important role in U.S. democracy. In honor of the official NFL season kickoff (today! ), we interviewed Armand Peterson, editor of The Vikings Reader, about his earliest Vikings memories, his Game Day routine, and of course, Brett Favre. Q: On Sept. 17th, 1961, you attended your first (and THE first) Vikings regular-season home game at Met Stadium. Can you tell us about it? A: The football field was laid out roughly along the baseball right field foul line. Since the (Minnesota) Twins (baseball team) still had some games left in their season, the baselines and infield areas of the baseball diamond were left un-sodded, and the mound was skinned down to football-field level. Attendance was only 32,236, but it was a near-full house. At the time, the left field bleachers were temporary and were moved toward the infield for football games (construction of permanent left-field stands in 1965, as well as other upgrades, eventually pushed the football seating capacity to 47,900). Compared to today's games in the raucous Metrodome, that first game was almost eerily silent. I do not recall any cheerleaders or a mascot parading around the field. There were no special celebrations by players after a touchdown. (At times), I could easily hear the quarterback's signal calls and the sound of pads when players collided. The overall noise built up when the Vikings scored their first touchdown, and got louder as they surged into the lead in their upset 37-13 win over the Chicago Bears, but I don't think any fans wished they'd brought ear plugs. Q: Do you have a favorite moment in Vikings history? Least favorite? A: My favorite moment was the second game of the season in 1969, a 52-14 victory over the NFL-defending champion Baltimore Colts. The Colts had manhandled the Vikings in a 24-14 win in the 1968 Divisional Playoffs, and the Vikings had started the 1969 season with a 24-23 road loss to former teammate Fran Tarkenton and the New York Giants. It looked like old times, but in the home opener quarterback Joe Kapp threw seven touchdown passes in the Vikings’ rout, and fans began to believe in the team. The Vikings won twelve straight games and finished with a 12-2 record. The team dominated conversations in offices, business places, factories and farms all over the state like never before. My least favorite moment was the 1975 Divisional Playoff loss to the Dallas Cowboys—made infamous for Vikings fans by Roger Staubach’s “Hail Mary” pass to Drew Pearson to defeat the Vikings, 17-14. The Vikings’ led the league in both passing and rushing defense, the offense was third in scoring and Fran Tarkenton was the NFL’s Most Valuable Player. The Vikings had been to the Super Bowl—and lost—after the 1973 and 1974 seasons, and we fans really expected to go to our third consecutive one. And this time we were going to win the Big Game! The loss to the Cowboys was devastating. Q: What is your typical Game Day routine? A: I guess I’m old school ... I am not interested in pre-game shows. I’m a hopeless hometown fan. I root for the Vikings, and don’t care what ESPN or a host of other 24-7 sports programs think about my team. So, if I have a routine, it is as follows: check the TV schedule and turn on the set at game time. My snacks are probably pretty boring, too—peanuts, popcorn and perhaps some nachos. Q: We have to ask: How will Brett Favre's presence will help the Vikings? A: The Vikings made the playoffs last year, thanks to the 8-3 record compiled by journeyman quarterback Gus Frerotte. Favre doesn’t have to perform like he did ten years ago to help the team—he just has to be competent. His presence will make opponents a little more cautious about stacking their defenses to stop Adrian Peterson. Q: As an editor who has done extensive archival research on the legacy of a national football team, what do you think Brett Favre's future chapter would look like in a theoretical compilation of the history of the Green Bay Packers? A: He will be ranked with Bart Starr, the quarterback for Vince Lombardi’s legendary teams. Some Packers fans no doubt are bitter about losing Favre to the Vikings, but time will erase these feelings. Jerry Rice, for example, the NFL’s career pass receptions leader, moved to Oakland after 16 years in San Francisco. He played four more seasons in the NFL, but is still revered by 49ers fans. He’ll wear 49er colors when he is inducted into the Hall of Fame. Similarly, no matter how well Favre does in Minnesota, he will wear Packer green and gold when he makes the Hall of Fame. Q: What are your bets on the Vikings' season ahead? A: The Vikings will make the playoffs. They did it last year, and are a much more balanced team in 2009. My heart tells me they will make it to the Super Bowl. However, my head tells me to be cautious (it remembers those four awful Super Bowl losses). The legendary Damon Runyan once opined that “the race is not always to the swift nor the battle to the strong—but that's the way to bet.” Based on his sage advice, I would pick New England to win the Super Bowl. Armand Peterson is a retired engineer. He is author of The Vikings Reader and coauthor of Town Ball: The Glory Days of Minnesota Amateur Baseball. September tends to be a busy time at the Press, and as such, we have scheduled two book-launch events for three books within one week. And that week starts today. 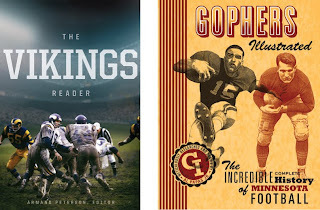 -Tonight at 7 p.m. at Magers & Quinn Booksellers in Minneapolis: Join Armand Peterson and Al Papas Jr. for a special night for football fans (not to mention all-around book fans). Peterson is the editor of The Vikings Reader, a gorgeous book that compiles 50 years of journalistic sketches of the highs and lows that make up the Minnesota Vikings' colorful history. Tomorrow, Peterson will answer a few questions on this blog about himself and his own experiences with the Vikings' victories and defeats. Papas is a sports cartoonist and former newsroom artist. He is the illustrator of Gophers Illustrated: The Incredible Complete History of Minnesota Football, which commemorates more than a century of Gophers football. Read more about both books in today's Star Tribune. 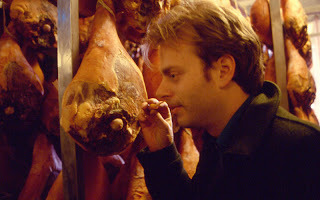 -On Sunday at 2 p.m. at the Varsity Theater in Minneapolis: Author Eric Dregni celebrates the publication of his newest book, Never Trust a Thin Cook and Other Lessons from Italy's Culinary Capital. Festivities will include a slide show of pictures from Eric's food-obsessed time in Italy; a book signing; and free appetizers from Loring Pasta Bar. A spaghetti dinner and drink bar will be available on a cash basis. This event is sponsored by Concordia Language Villages on behalf of Lago del Bosco and the Italian Cultural Center. Find out more about upcoming University of Minnesota Press events (in Minnesota and all over the country) on our website and on our Facebook page. Sunday's New York Times has a piece on an interesting book experiment created by SharedBook, a reverse-publishing company whose motto is "Made any good books lately?" In this very interesting and potentially groundbreaking experiment, readers will be allowed to chime in on three chapters of the parenting book Nurture Shock: New Thinking About Children. SharedBook will offer the footnotes for sale, and all reader comments will remain unmoderated and unedited. Mr. Bronson (Po Bronson, one of the book's co-authors) said he liked the idea of the SharedBook experiment for the “Nurture Shock” chapters because he wanted to create a community of readers. “They can have a granular discussion and find other people who are interested in having that discussion,” he said. But he was not sure readers would want to buy an edition of compiled reader comments. It would depend on whether “the commentary is so high level that people would want to buy the SharedBook version,” he said. Each year hundreds of words are dropped from the English language. Old words, wise words, hard-working words. Words that once led meaningful lives but now lie unused, unloved and unwanted. Today, 90% of everything we write is communicated by only 7,000 words. You can change all that. Help save the words! 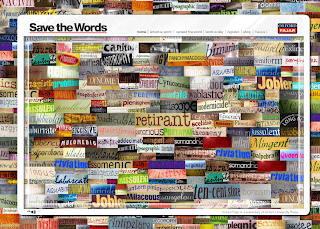 This attractive and very well-designed website also has handy suggestions for you to help save the words in everyday life, including how to drop near-extinct words at board meetings and what to name your pet ("Cestuan," anybody?). The following story is from Doug Rutledge, who, along with photographer Abdi Roble, has been documenting the lives of Somali immigrants in the U.S. since 2003. In The Somali Diaspora, Roble and Rutledge trace the journey of a family from the Dadaab refugee camp in Kenya to new lives in the United States. An exhibit of Roble's photographs of large Somali communities in Minnesota, Ohio, and Maine is running at the Weisman Art Museum in Minneapolis until Sept. 27th, 2009. On a very pleasant Minneapolis evening, when Abdi Roble and I were finished working for the day, we found ourselves being driven toward our hotel by a young Somali man, Warsame, whose family we had been documenting. While Warsame was taking us home, our friend Paul, who is also a documentary photographer, called and suggested that we meet and talk about our work. He asked if we could go somewhere he could have a beer. My two Somali friends were quite comfortable with that suggestion. Warsame had recently finished his term in the armed forces, so he clearly was not unfamiliar with American men who wanted to have a beer. The minute we went to the bar, Abdi and Warsame demonstrated the hospitality typical of Somalis. They took our order and went to the bar. They paid for all the drinks, and retrieved sodas for the three of us, but they asked Paul if he would mind stepping up to the bar to pick up his own beer, an act he performed with grace and aplomb. One needs to let one’s mind settle on this picture for a moment. Two Somali Moslem men, one an ex-soldier, and both very accustomed to the cultural habits of young Americans, purchasing a beer for an American friend. Neither man felt uncomfortable in a bar or even uncomfortable buying a beer for a friend who wanted it. However, neither man would touch the beer or carry it, for that is hiraam, or "forbidden," according to Islam. Now, one would never accuse either of these gentlemen of imposing sharia law or even of imposing the moral code of Islam onto their friend Paul. Indeed, they never so much as mentioned the moral code they impose upon themselves when Paul said he wanted to drink a beer in their company. Their only hesitation occurred when hospitality to Paul might ask them to carry or touch the beer. This they could not do. They were quite happy to be in the bar, and watch their friend imbibe the refreshment of his choice. All they refused to do was to carry the beer. This moment has always seemed to me to offer a cultural context to the cabdriver affair that haunts the Twin Cities. Like my two very dear friends, Somali cabdrivers hesitate to carry alcohol. They are in America, so they need to make a living here. But sometimes, they find themselves in the awkward position of being asked to carry a substance in their vehicle, an act that they take to be against their religion. If you spend a bit of time talking with the Somali cabdrivers, you will find that they have a variety of backgrounds. Educators, engineers, heavy equipment operators, and farmers all often find themselves being cabdrivers in America, because language and license requirements often prevent them from applying for the careers that their skills might have otherwise encouraged them to pursue. These are all, it seems to me, potential friends. Cultural differences can and should remain. If America means anything, it must remain a place where people are free to be who they are, believe what they want and yet remain friends with people who believe otherwise. As long as we can all sit down and enjoy our culturally preferred refreshment together, we can share our experiences and be friends. It shouldn’t really matter if we have to carry our own drinks to the table. Doug Rutledge, Ph.D., is a writer for The Somali Documentary Project and a visiting scholar at The Center for African Studies at Ohio State University. This photo appeared yesterday on the Star Tribune Books section's Facebook page (managed by editor Laurie Hertzel) with the following inscription: "Gone, but not forgotten. 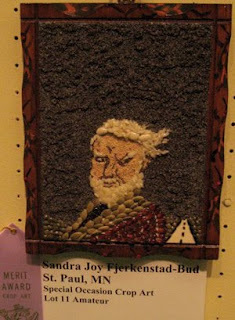 At the Minnesota State Fair, poet Bill Holm, rendered in seeds." Bill Holm's work appears in the brand-new compilation Our Neck of the Woods, edited by Daniel J. Philippon, and in The Quiet Hours, a book of photography by Mike Melman, in which Holm has an essay that compares Melman's work to that of Walt Whitman and Carl Sandburg. Also: this spring, the University of Minnesota Press will publish the 25th anniversary commemorative edition of Bill Holm's The Music of Failure.